The Southern African Development Community (SADC) needs to continue pushing for industrial growth and development in the region, says President Cyril Ramaphosa. With the help of the private sector, the region must also put special focus on developing skills in agro-processing, mineral beneficiation, energy and pharmaceuticals. This will enable the region to find lasting and sustainable solutions to poverty, inequality and underdevelopment. “We, therefore, need to ensure that we create a conducive environment for business to thrive, and to deepen our engagement with the private sector. “Collaboration with the private sector is important not only in designing SADC regional strategies and initiatives but also in identifying impediments to greater regional economic integration,” said President Ramaphosa. 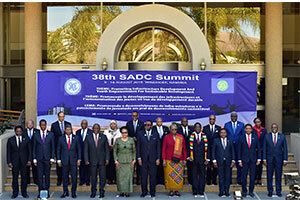 The President was addressing the 38th Ordinary Summit of the Heads of State and Government of the Southern African Development Community (SADC) underway in Windhoek, Namibia. As the outgoing chair of the regional body, the President delivered his report to the summit outlining the work of the regional body for the duration of South Africa’s tenure as chair from August 2017 to August 2018. “Over the period of our chairship, we have been able to secure more than $500 million of committed productive investments by South African companies in each of the priority value chains across the region. “The investments cover forestry, agriculture and agro-processing, fertilisers, mining and mineral processing, and pharmaceuticals,” President Ramaphosa said. He used his address to give an update on a number of projects undertaken by the region such as the framework model on the control and management of the Fall Army Worm, which is being rolled out with the Food and Agriculture Organization. Capacity building workshops have been held in Mozambique, Madagascar and Zambia. The SADC Integrated Regional Electronic Settlement System has gained significant momentum, establishing a firm platform for increased intra-SADC trade and investment and further strengthening regional financial integration. The SADC Energy Foresight and Assessment Study in support of the SADC Industrialisation Strategy and Roadmap are underway, with data gathered from six of the member states. President Ramaphosa reported that the SADC Engineering Needs and Numbers study is close to completion. It aims to obtain a better understanding of the engineering capacities in the SADC region to allow for better planning and implementation of infrastructure programmes. Progress has been made in addressing tuberculosis in the mining sector across 10 SADC countries. More than 10 000 claimants received payment and one-stop service centres were opened in Botswana, Lesotho, Mozambique and Eswatini, thereby increasing access of ex-mineworkers to decentralised services. Other progress reported include the Medicines Regulatory Harmonisation project that is focusing on establishing and strengthening regional and sub-regional networks of regulatory authorities, as well as the implementation of Phase III of the SADC Roam-Like-At Home Initiative, which began in October 2017. This entails the development of a harmonised cost model for wholesale and retail roaming tariffs to be used by all national regulatory authorities in SADC. “Through our joint efforts, the region has now established a healthy pipeline of bankable projects, which we now need to see through to completion,” the President said. Investment in infrastructure, President Ramaphosa said, must be the central priority to lower transaction costs, enhance regional markets and make production and exports more competitive. Looking into the future, President Ramaphosa said SADC needs to harness the youthfulness of the region by developing human capital, speed up economic growth and foster sustainability. Another key focus should be the diffusion of digital technologies to secure the future. The digital economy is an increasingly important driver of economic growth and can play a significant role in accelerating development, enhancing the productivity of existing industries, cultivating new markets and industries, and achieving inclusive, sustainable growth. South African companies have pledged to invest $500 million in countries in the South African Development Community (SADC), President Cyril Ramaphosa announced at the weekend. President Ramaphosa made the announcement at the conclusion of the two-day 38th Ordinary Summit of the Heads of State and Government of the SADC in Windhoek, in Namibia, on Saturday. President Ramaphosa, as the outgoing chair of SADC, reported to the Summit the work of the regional body for the duration of South Africa’s tenure guided by its tenure theme, “Partnering with the Private Sector in Developing Industry and Regional Value Chains”. Outlining his stint, which began when he was inaugurated as South African president earlier this year, President Ramaphosa outlined that during South Africa’s tenure as SADC Chair, $500 million was secured of committed productive investments by South African companies in each of the priority value chains across the region. These included investments in forestry, agriculture and agro-processing, fertiliser, mining and mineral processing, and pharmaceuticals. “We therefore need to ensure that we create a conducive environment for business to thrive, and to deepen our engagement with the private sector. Collaboration with the private sector is important not only in designing SADC regional strategies and initiatives, but also in identifying impediments to greater regional economic integration.” President Ramaphosa said. President Ramaphosa said he was encouraged by strides taken to maintain peace and stability in the SADC region, including the holding of regular, free and fair elections, saying that “the consolidation of democracy and the elevation of the rule of law across the region is a sign of the improved effectiveness of our regional institutions and mechanisms”. Prior to attending the summit, President Ramaphosa joined the SADC Organ on Politics, Defence and Security meeting on 16 August 2018. Former Presidents of Namibia, Sam Nujoma and Hifikepunye Pohamba, as well as Former President of Mozambique, Joaquim Chissano, as elder Statesmen of the region and founding fathers of the Southern African Development Community, were part of the SADC Day (17 August 2018) celebrations at the Summit. The President handed the Chairship of SADC to Namibia President, Hage Geingob. He also expressed gratitude to the region’s Heads of State for welcoming him warmly and supporting his chairship.